The Majaka 54 - 13 investment property is a large 94.5m2 two-floor apartment located next to Tallinn’s Ülemiste City tech hub. The apartment building itself is old, and is in need of some renovation. However, our apartment number 13 is a brand new addition to the property. The apartment is divided between the 3rd and 4th floors, which are both new constructions on top of the original building. The apartment’s current layout consists of 45m2 on the 3rd floor and 49.5m2 on the 4th floor of the building. In addition, the duplex apartment has an 8m2 storage room located above the 4th floor. The apartment is currently in shell condition, with no interior finishings, no water pipes or electrical wirings. The building’s facade is also in need of renovation. Majaka street is becoming a new addition to the city centre, with various new developments being built in the surrounding area. The new T1 Mall of Tallinn is located across the street and it is planned to become the new heart of the capital, including a one-of-a-kind shopping and entertainment centre. Furthermore, the neighbouring Ülemiste City tech hub is a rapidly developing area, located right next to Tallinn Airport, welcoming international startups and tech companies. 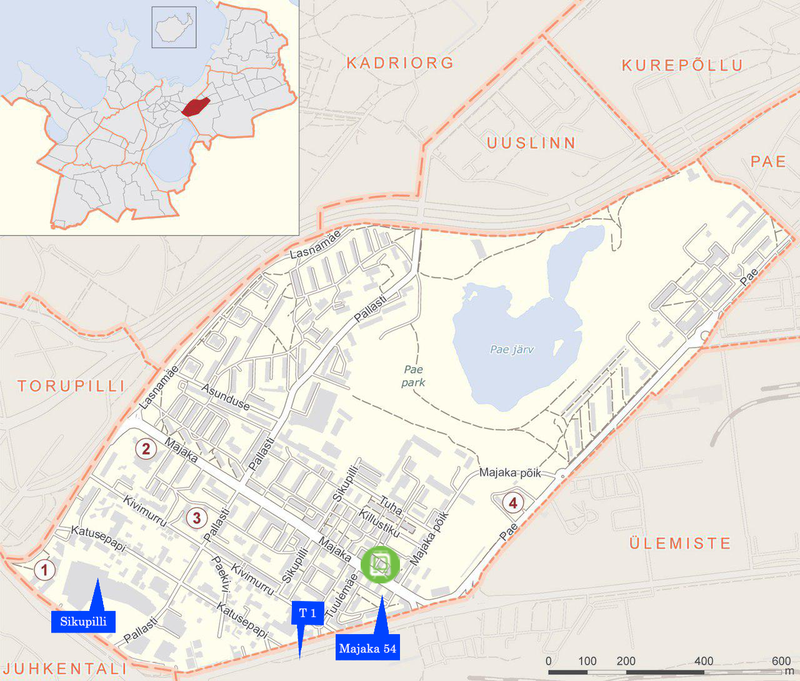 The Majaka/Sikupilli area where our property is located was once considered as the outskirts of Tallinn, but due to the large developments taking place and its proximity to the airport, it is now an organic part of the city centre. This flourishing neighbourhood also has various new schools and kindergartens due to the area’s newfound status as a business and tech district. There are various amenities surrounding the property, including the Ülemiste and Sikupilli shopping centres, gas stations and public transportation. Our property is conveniently connected to various bus and tram stops, which take you directly to the airport (4 stops away) and the city centre (10 min away). From the Ülemiste train station you can also get the train to Tartu (2 hours away), Estonia’s second largest city and home to the prestigious Tartu University. The property for investment with the address Majaka 54 - 13 Tallinn, Estonia is a duplex shell apartment located in an old apartment building that is in need of modernisation. The property has the opportunity to be converted into short-term rental apartments. Furthermore, the property is located in a flourishing area, next to the airport and various other new developments. After purchasing the 94.5m2 shell apartment, we have restored the expired building permit to finish its construction and interior finishing. The apartment is currently a blank canvas, which allows us to alter the interior layout and choose quality materials that will increase the property’s value. Once we have finished the construction and renovation of the apartment; including all interior finishes, electrical wiring and water piping, we will move on to the building’s facade and roof. As part of the investment, we will cover a proportion of the costs involved with the building’s renovation, together with the other apartments located on the 3rd and 4th floors. A part of our investment budget will also be allocated towards the necessary furnishings of the property, to ensure it is habitable and ready to rent out. This project is a 2-stage investment opportunity. Our first stage includes the development, followed by renting out the property as two separate dwellings. Our investors can enter the investment and increase the value of their investment via the development stage and then earn a passive monthly income once we rent out the property. Purchasing the property at this stage and investing into finishing the construction of the apartment and renovating the building itself will increase the value of the property to approximately 2100 eur/m2 (considering the current market situation). This will be a brand new apartment in a developing and strategically good area. The estimated capital growth from the development for our investors is 20,3%. The apartment will be rented out daily/weekly via sites like Airbnb and booking.com to further increase the rental yield. The property’s strategic location next to the airport and Ülemiste City tech hub ensures there will be a profitable demand. The estimated annual income from rent for our investors is 8.01%.